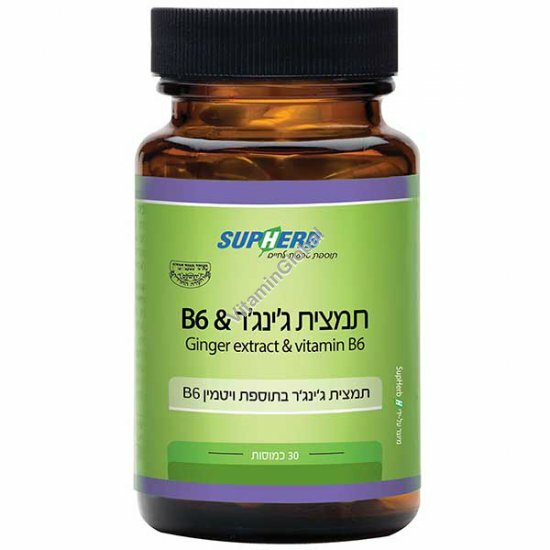 A unique combination of Ginger root standardized extract with vitamin B6, for providing relief from sickness (nausea) and vomiting during pregnancy. In extreme cases, anti-sickness medications are given. These medications are not recommended for prolonged use, and it is advisable to completely avoid them during the pregnancy period. The unique combination of ingredients in Sickrid and the optimal dosages ensure relief from sickness and vomiting among pregnant women, is safe to use and side-effect free. Safe to use by pregnant women and side-effect free. Ginger has been known for many years as a reliever of sickness and vomiting, and fact that it is safe to use and side-effect free, has made it commonly used by pregnant women. The active substances responsible for the therapeutic qualities of Ginger are called Gingerols, and it is those which endow Ginger with its typical taste and smell. Ginger relieves sickness by increasing the production of digestive fluids, and by absorbing and neutralizing stomach acid and toxins in the stomach, and improving the activity of the intestines. Sickrid contains a standardized extract of Ginger which ensures a high and fixed quantity of Gingerols- the active substances in the Ginger root. Pregnancy sickness may occur due to a deficiency in vitamin B6. Sometimes the deficiency in the vitamin stems from prolonged usage of birth control pills. It is recommended, when planning a pregnancy, to regularly consume vitamin B6 or multi-vitamin supplement which contains the vitamin, to prevent a deficiency. Vitamin B6 has been found to be effective for relieving sickness in a manner similar to anti-sickness medications, and safe to use during pregnancy. Sickrid contains vitamin B6 in the form of the coenzyme P-5-P, for optimal absorption and activity. Eat 2-3 crackers even before you have gotten out of bed. A slice of lemon or ice may relieve the sensation of sickness. Eat small and frequent meals, preferably carbohydrate-rich (bread, rice, Pasta). Drink a lot, mainly water or soda, between meals. Avoid spicy foods, with strong smells, and fatty and fried foods. Avoid drinking coffee, the smell of coffee, or any other smell which provokes a sensation of sickness. Directions: 1-3 capsules a day, as necessary, morning and evening. Recommended in Combination with: Pre-Gently, Bio Female. Available in bottles of 30 capsules.